We have a dedicated full bar area where we serve mixed cocktails, imported and domestic beers and our legendary and famous “Buffalon Milk”. Coupled with live nightly music from our surround Sound, sultry lighting; our romantic ambienece is unmatched. Bienvenidos! and Welcome We are thrilled to be considered to cater your next event. Here at Buffalo Nickel Restaurant, we help you plan a fantastic menu for your special celebration whether it is a company luncheon, cocktail party, picnic, family reunion, or you just want the perfect setting to taco about. 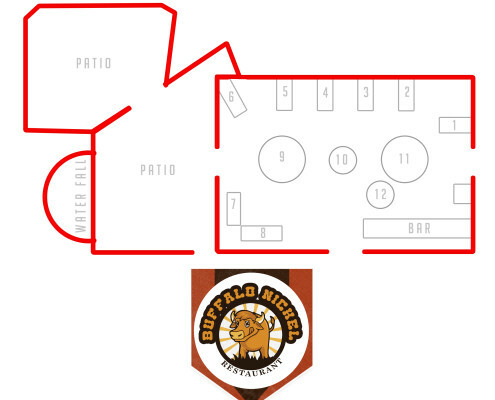 At Buffalo Nickel, we have an extensive variety of options for you to choose from for your next event. From to-go platters and festive taco bars, Pasta bar, to a wide selection of appetizers for cocktail parties and custom planned dinners, we can meet your party’s needs. If you have any questions feel free to contact us at 310 510-1323 Will see you soon Thank You! Our Private Room Party’s are legendary! If you need any details give us a call! We will be happy to answer all your questions.